By now you all know I love quotes. It’s why I’m doing this Quote It Wednesday, so it’s not really a surprise. But if there’s one type of quotes I love more than others, it’s book lover quotes. Something about hearing my fellow (albeit fictional) bookworms speak lovingly about books just makes my heart feel all mushy. 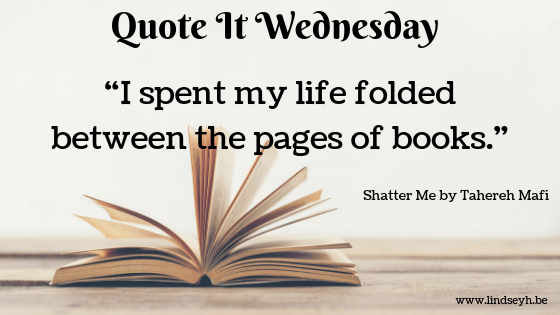 So that’s why today I’m presenting this lovely quote from my fellow bookworm Juliette from the Shatter Me trilogy. Do you also love a good book lover quote like me? I love when characters are bookworms just like me! Sometimes I feel a little weird that I love books so much, and not many other people in my life seem to, so it’s nice when I can relate to a character like that.